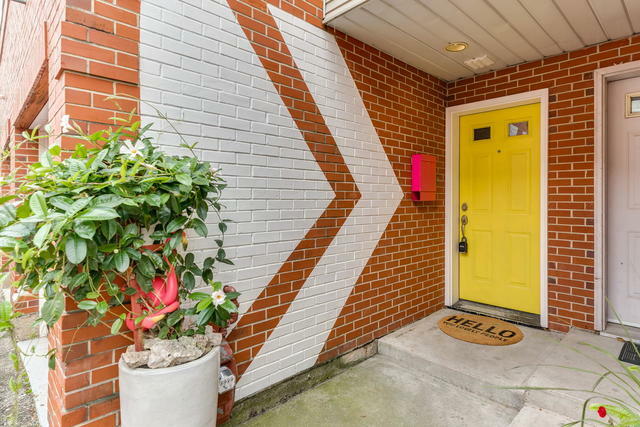 Amazing opportunity to own this Super Chic Sun Filled, Logan Square Totally Renovated 3 Bedroom, 2.1 Bath Fee Simple Townhouse by well known designer! Property being sold FULLY FURNISHED! This is Special offering as its Hip Vibe and Lifestyle all could be yours with the turn of the key to the front door! Open Concept Floor plan offers White Island kitchen, Viking Range, Pantry & Concrete Counters. Hardwood Floors, Streamlined lighting, Hippest Master Suite ever with Beautiful White Marble Stone, Free Standing Tub, Rustic Vanity & Even a Hanging Bed from ceiling! Large 2nd and 3rd bedrooms, 2nd Bath with light gray glass Subway Tiled Walk in Shower. Laundry in Unit, Cool Patio off the Living room plus Full Private Roof Top Deck! One Car Attached Garage Included! Incredible Investment for anyone who wants a turn key property or for an Investor as this has no rental restrictions and the investment return is there. Sweet location with the 606 literally right out the door! Must see!